When it comes to communicating with customers, we often focus on the right words and the right medium, but far less attention is paid to the right time. Partly this is because the “perfect time” has so many different variables. Trying to craft a message that matches every customer’s lifecycle, location and activity, not to mention their device and environment, can seem like a Herculean task. It’s why so many people don’t bother, and why you still get “We haven’t seen you in a while” emails at 3am. If all these variables are making your head spin, don’t despair. By analyzing millions of messages sent through Intercom, we’ve uncovered a few steps you can take to make sure your messages arrive at a time that’s appropriate to the maximum amount of people possible. Intercom is a B2B product and our data reflects that. Saturdays and Sundays might well work for a consumer audience, but we’re simply not the best judge of that. Our data focuses on when messages were opened. Certain times may result in more clicks, others in more message replies. Use this data as a good proxy for messaging activity, not as gospel for every message you send. Ready? Let’s dive into the data. 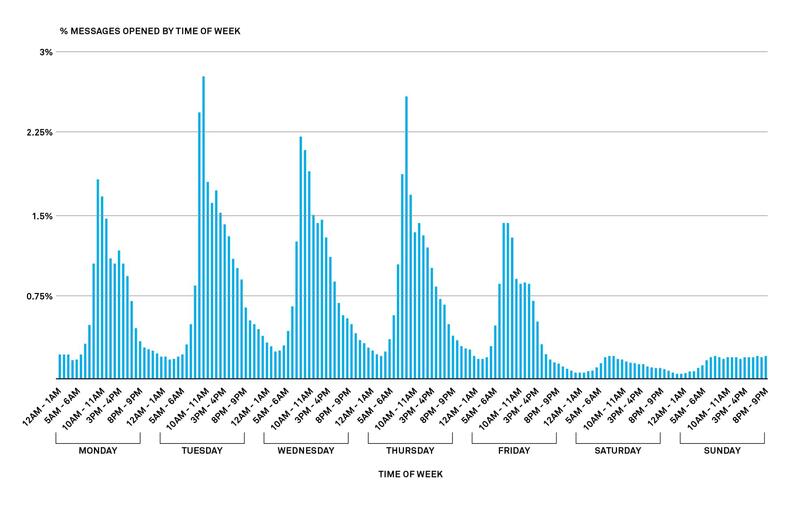 If we examine this over the entire week, we can see that Tuesdays, closely followed by Thursdays, get the most messages opened compared to any other day of the week. 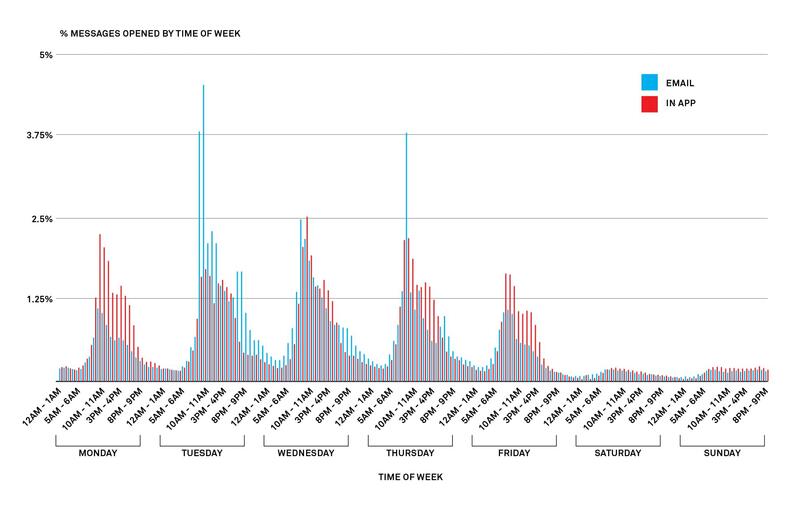 In fact, all our data shows that most activity happens during the middle of the week with only minor outliers. In short, the high-level advice from our data is that your message has the greatest chance of being opened between 10-2pm Tuesday-Thursday. Sidebar: if you’re looking at this data and thinking to yourself, “All this hard work for only a 12% open rate. What gives!”, rest assured that this is entirely normal across the industry. There is simply no one perfect time that everyone downs tools and checks their email, so stop hoping for that silver bullet. It’s when we start breaking this data out by message type – by in-app and email – that things start getting really interesting. For example, let’s take a look at the daily open rates for in-app vs email. The spike of email opens between 10-11am is the highest open rate of any message across Intercom. The marketer in me starts rubbing my hands together when I see that spike. “Let’s send all our messages at 9am before everyone gets into the office!”. But that spike really only tells us part of the story. 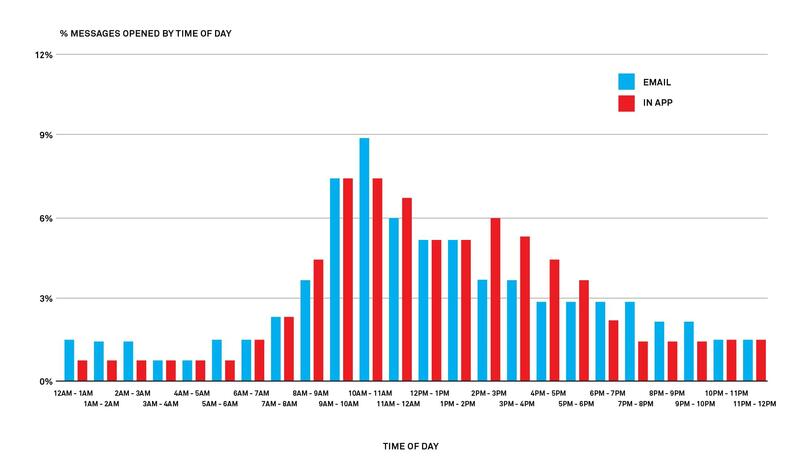 The disparity of open rates between 10am and 4pm are much greater across email than across in-app. There are significant peaks associated with email, but in-apps remain more constant across the day. Just compare in-apps at 9am and 3pm, for example. Pretty steady, right? What we’re seeing is that there is a window of opportunity associated with email on days like Tuesday and Thursday. Hit that, and your message will have a high chance of being opened. But if you’re looking for a consistent open rate throughout the day, consider in-app. This pattern is confirmed if we examine the data over the course of a week. Emails sent between 10-2pm on Tuesdays and Thursdays have the greatest chances of being opened, but in-apps have a remarkably consistent open rate throughout the entire week. 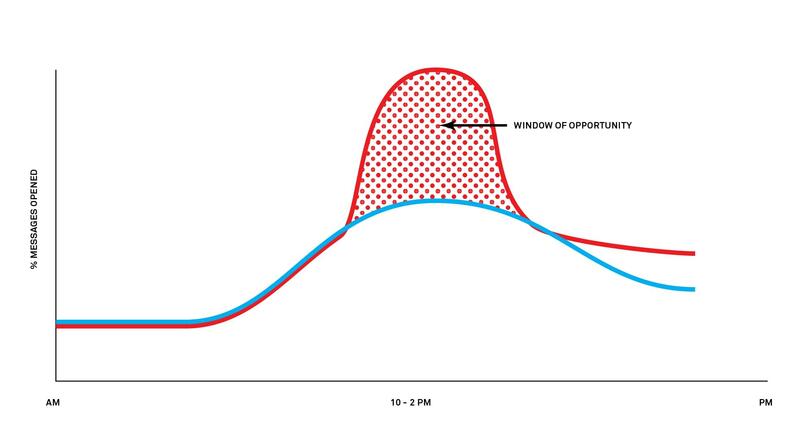 For example, you’ll have a much greater chance of getting an in-app opened than a email on a Friday. Likewise, late afternoon seems to be a particularly successful time for in-apps as opposed to email. But just because there’s no one global send time to rule them all, the patterns we’ve observed above can help us to draw some conclusions that will help you send messages that land at the appropriate time. At the very least, it’ll ensure your messages won’t get a wtf reaction when they arrive. 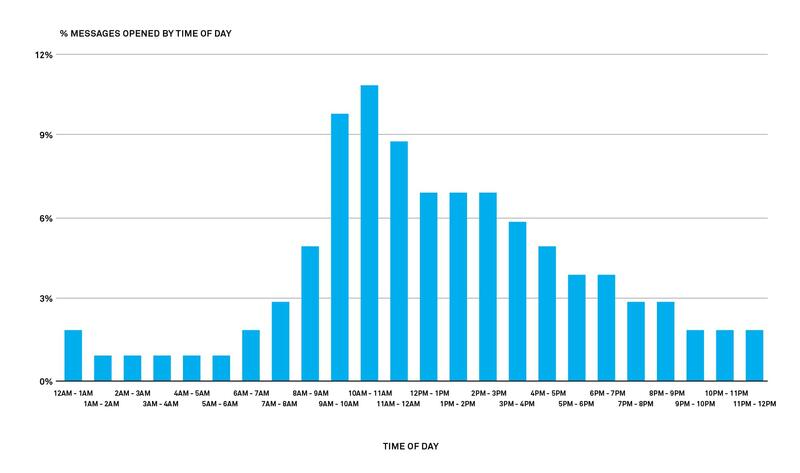 Across email and in-apps, messages have the most chance of being opened from 10-2pm on a weekday. Unless you have good reason, avoid sending messages outside of business hours in the recipients’ time zone. Time of week and time of day matters less for in-app messages than email. Between 10-2pm is best, but really as long as it’s during business hours you should be fine. These answers might not put the age old “What time do I send?” question to bed forever, but they’ll provide plenty of solace when your cursor is hovering over that send button. Sincere thanks to Nick Odlum and Kevin McNally from Intercom’s Product Analytics team for helping to collect and synthesize this data.